Why Does Ink Come Out of a Tattoo? Even with perfect care, your tattoo will slowly fade and lose ink over time. This is because there is no way to stop the things that happen to your skin as you age. There are, however, ways to slow ink loss. Ink left on the surface of your skin will transfer to the bandages of a fresh tattoo but will not impact the tattoo's color. Too much healing ointment, however, will draw some of the ink out of your skin. Antibacterial ointment is an important part of the healing process, but don't use more than your tattooist instructed you to use. Scabs pulled prematurely from your tattoo may take some ink with them, so avoid picking at them and let them fall off on their own. Cover the tattoo if need be to prevent clothing or bed sheets from disturbing scabs prematurely. Although you paid a lot to have it put there, ink is a foreign substance and your body's natural response is to try and remove it. The pigment breaks down over time and the immune system then carries it away through the lymph nodes. Your body won't be able to remove all the ink, but it will get some. The natural process of renewing and sloughing off dead skin cells will also remove some of your ink as you age. 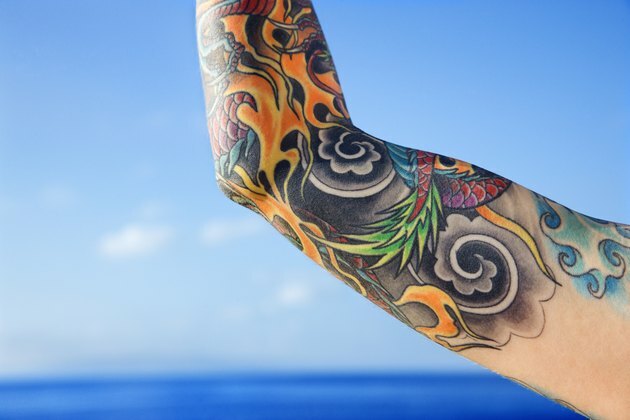 The sun's ultraviolet light speeds this process, so cover your tattoos with SPF 45 or higher sunblock.